It's sort of amazing that fifteen years ago I gathered with a small group of people I met at the then relatively new Phat N' Jazzy club night to plot the formation of the Eighth Dimension "collective". The idea was to help each other out, working towards the common goal of some sort of success in the music industry. Since then Eighth Dimension has evolved into a record label, a music publishing company, a management/consulting team, and, most recently, an independent publicist helping other labels get their music out there. As the cliché goes, it's been a long, wild ride. It was Jon (Pimp Daddy Nash) who had the realization that we've hit fifteen years as a business and, certainly, as friends and it was his feeling that a party was in order. I'm really not one for celebrations such as these but I've gotten a bit more excited about it as the date closes in. This party will be a nice excuse to hang with all these great people who helped make my last fifteen years navigating the music landscape a fun, exciting, and much less complicated endeavor. I'm also expecting many of the fans and friends who have come in and out of our sphere in this decade and a half as well as the newer faces who are just there to hear some great tunes. So, here's the line-up: I (Mr. Q-Burns Abstract Message) will be doing my thing, and I'll probably lean my set towards the music I was playing in the early days of Eighth Dimension for the sake of nostalgia. 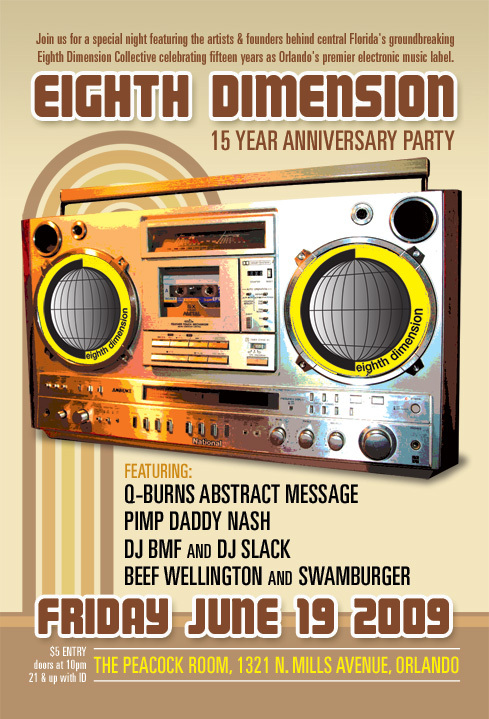 DJ BMF will be there who, as you may know, has always been hands down my favorite Orlando DJ. 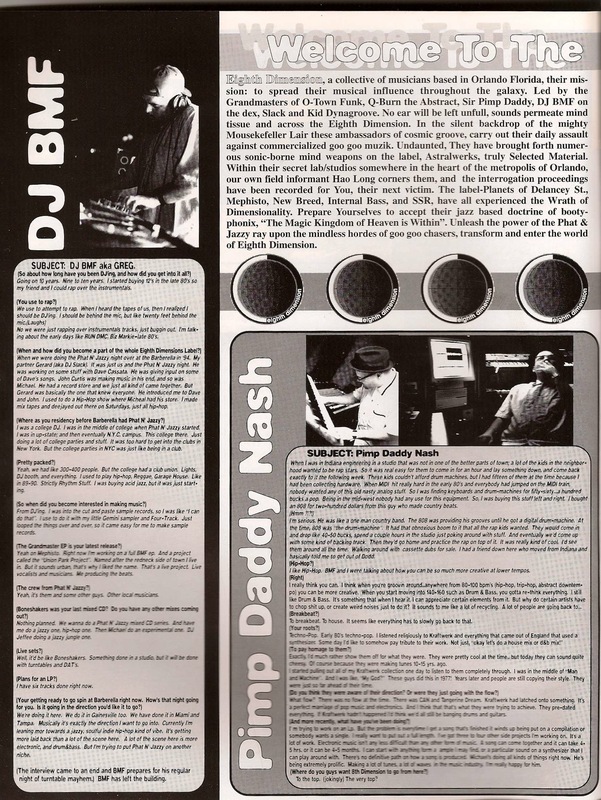 The aforementioned Pimp Daddy Nash will be doing a rare set (pretty much coming out of retirement as a Pimp) and I've heard he's put together updated reinterpretations (remixes?) of some of his older tracks for the occasion. And then two artists who weren't there at the original meeting but who have since become a very important part of the Eighth Dimension family, Beef Wellington and Swamburger, will be doing a collaborative set. It's going to be a top night of top tunes. This is all taking place this Friday, June 19 at The Peacock Room, located right by the corner of Virginia and Mills ... click HERE for a map and directions. The music starts at 10 PM, we're charging a $5 cover to pay for Pimp Daddy Nash's limousine, and it's 21 and up. I may even have a few musical giveaways depending on what I can rustle up. The flyer is below ... we'll see you there! 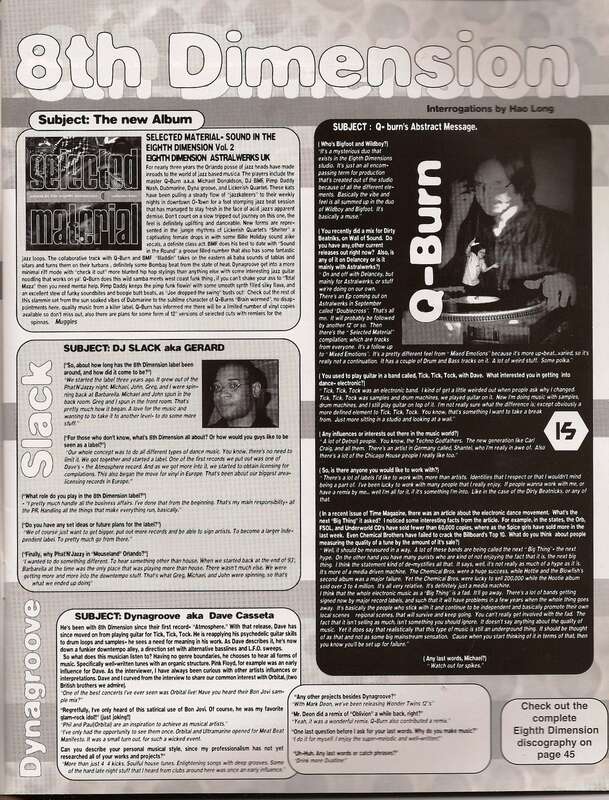 Also - as an added retrospective bonus, I've scanned a 1997 interview/article on Eighth Dimension from Tampa's old school Synergy Magazine. Pardon all of the misspellings and grammatical errors (my artist name is written wrongly throughout) but these mistakes are certainly endearing ... i sort of miss the fanzine days that have now given way to the blogs. I also like how I refer to Carl Craig as part of the "newer generation" of Detroit techno artists ... wow, this is from long ago, innit? You can read page 1 HERE and page 2 HERE. Enjoy!